John Barrowman’s Captain Jack Harkness made an instant impact when he confidently and flirtatiously burst onto the scene alongside the Ninth Doctor and Rose, so much so that he would quickly go on to headline Torchwood when given a second (and more) chance at life. Yet given the presence of his vortex manipulator and his occasional intersections with the Tenth Doctor after being left behind with the Ninth, it was always clear that Jack’s life was filled with much more than the secretive defense of the Earth, and Big Finish’s The Lives of Captain Jack arrives to further expand upon the roguish hero’s many exploits on Earth and abroad. Picking up after the events on the Game Station in ‘The Parting of the Ways’ where Jack met death head on, ‘The Year After I Died’ by Guy Adams reveals a Jack who is much more cautious than ever before, determined to live a silent life in order to fully enjoy his apparent miraculous escape from the Daleks. This is a bold choice for Adams precisely because it goes so against the character’s usual bravado, but it’s incredibly effective in further developing this well-established hero at a time when he wanted to be anything but, and Barrowman excels at portraying this much more restrained and nuanced take on Jack that effectively convinces of the horror he has experienced and the more subdued hopes for the future he now has. Of course, it’s not long until he finds himself caught up in a conspiracy to destroy the refugee remnants of humanity by its oldest foe when the idealistic journalist, Silo Crook, tries to tell Jack’s heroic story but soon finds her very life threatened. Shvonne Marks puts in an incredibly engaging performance and easily carries a substantial portion without Jack present to introduce the dark story of the privileged preying upon the downtrodden without remorse. Sarah Douglas’s Vortia Trear is unrelenting in her greed and callous disregard for others and contrasts perfectly with Jack’s representation of the very best humanity has to offer amidst a truly desperate population struggling to survive after being beaten down by the Dalek forces. Trear’s tense threat is purposefully a bit overly ostentatious and fairly narrow in definition, but she allows the vulnerable Jack to reassert himself as his heroic tendencies shine once more and he begins to learn just how much he has changed since parting ways with Rose, in the process highlighting one of the most captivating and fascinating versions of Jack to date. ‘Wednesdays for Beginners’ by James Goss brings Camille Coduri’s Jackie Tyler into the fold as the Powell Estate finds itself under attack and under the shroud of a strange fog. Jackie, of course, was one of the more divisive figures of the early years of the relaunched Doctor Who because of the stories’ heavy reliance on domestic affairs with Rose at the forefront, but there was never any denying that Jackie taken solely by herself regardless of context within any one episode was a captivating and brave but flawed human being that Coduri brought to life wonderfully. Accordingly, given the time Jack spent waiting for a proper version of the Doctor to show up, it makes perfect sense that Jackie and he should cross paths as he secretly checks in on the Tylers and Powell Estate periodically, and the pairing of Coduri and Bowerman is absolutely fantastic as expected in what amounts to a two-hander once the other residents of the Estate strangely disappear. Like the preceding story, Jackc is actually absent from proceedings for a good portion early on, allowing Coduri to re-establish her character and the unfolding mystery around her. Fittingly, she believes Jack to be a stalker initially, though the tables quite quickly turn as Jackie becomes quite enamoured with him, and the immense flirtatiousness of both characters shines as a more comedic tone is set before the true danger of the Harvesters is revealed. The threat works quite well because of the distinct methods of action that it inspires in the two heroes, Jack sure that he is the cause and thus willing to sacrifice himself to free Jackie while Jackie tries to piece together the puzzle to offer a more intimate solution. Appropriately, the connections to the Doctor and Rose are squarely dealt with in the process, and it’s rewarding to see that the usual conventions of this era have wholly unexpected consequences when the Harvesters’ plans approach fruition. This is a story that will be judged solely by each listener’s feelings toward Jackie, but the surprising emotions and visuals on display as Jack and she begin come to terms with their surroundings are wonderful and create an engaging and unexpectedly poignant tale by the end. ‘One Enchanted Evening’ by James Goss picks up on the narrative thread of the Doctor introducing Captain Jack Harkness to Midshipman Alonso Frame during his farewell tour in ‘The End of Time Part Two.’ Amazingly, given that this is their first fateful night together, the chemistry between John Barrowman and Russell Tovey is electric, and though no single story portraying an introduction could ever realistically suggest that one is ever ready to die for the other in the name of love, the two manage to form an endearing and engaging connection that certainly becomes a factor in why both independently are once more willing to sacrifice their lives partially in the hope of keeping the other alive. By this time, Jack fully understands that he borders on immortal and so he understandably takes the fight directly to the nefarious Mother Nothing who has ruined his romantic evening aboard the space station, but it’s Tovey’s more understated but equally proud performance that truly steals the show as Frame tries to put his last experience on a ship behind him to once more assume control and try to save as many innocent bystanders as possible, and both performances and styles complement each other exceedingly well. Given the two characters and the fact that Jack is trying to learn to open up to others once more after losing Ianto, it’s a bit surprising that the story takes on more of a set piece action adventure feel than the character drama that the title and setup may initially suggest. To that effect, Katy Manning gives an immensely powerful and energetic performance as Mother Nothing, an insectoid creature with an insatiable greed and hunger who knows no compassion for anyone or anything. The problem with the threat is certainly not in the performance, although the over-the-top nature of something like Manning’s own Iris Wildthyme crossed with the Racnoss and amplified by a thousand may be off-putting to some, but in the fact that it is ultimately generic with no nuance or definition beyond simply wanting the diamond at the core of the ship. Vortia Trear’s plan in the first story of the set was already something akin to being evil simply because she had the means and desire to be, and so it’s unfortunate that a second villain follows suit with little deeper nuance, making the narrative here even more reliant on its big action sequences and imagery that are fortunately uniformly excellent. ‘Month 25’ by Guy Adams closes out the set by going back to Jack’s time spent in the Time Agency and exploring his quest for the missing two years of his life as Jack searches for a mysterious floor that is only sometimes there as well as funds that are being retroactively stolen from his account. Barrowman impressively pitches his voice subtly differently to bring this younger version of his beloved character to life, and it’s unsurprising that the brashness and cockiness is even more pronounced here in a young man who has not yet had to develop a strong moral code or deep understanding of the importance and fleeting nature of life. Bad at being both an employee and a friend, this is not a hero or even a character who could reliably anchor a series, but this brief look into Jack’s past offers intriguing insight into where he comes from without completely eliminating the mystique surrounding his vaunted past. Naturally, the mystery surrounding the inner workings of the Time Agency and those at the very top become just as integral as Jack himself in a story that finally reveals his true name, and the unexpected ally he finds along the way adds an extra depth that turns this time-centric caper of greed, betrayal, and conspiracy into something altogether more interesting while quite rightly opening up Jack to criticisms about selfishness and self-centredness. With immense and charismatic performances from Alexander Vahos and Sakuntala Ramanee in support, the mystery unfolds fluidly and naturally, and though the ending comes off as quite easy given the secrecy and duplicity encountered along the way, ‘Month 25’ as a whole features the most interesting storyline of the set and provides strong closure by offering the most thorough look at Jack’s very full and exciting but also very shrouded past yet. Captain Jack Harkness has lived such a long life that there is near-infinite number of potential storylines and sides of the character to explore. The four brief snippets here offer an engaging look at the nuance that John Barrowman can bring as different times are explored, and there’s just enough emotion at the heart of each of these stories to give needed extra resonance to somewhat superficial plotlines that allow the heroes to take centre stage. 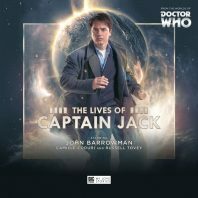 For fans of Captain Jack and the Russell T Davies era of Doctor Who, The Lives of Captain Jack is a well-crafted and well-polished homage that proves once more how well the new series sensibilities can translate to the audio medium with the skilled and caring minds at Big Finish.